This event is now SOLD OUT! Thank you for all your support, it promises to be a great night. We would love to invite you, your family and friends to our fundraising Band Night on 18 March 2017. The evening promises to be great! 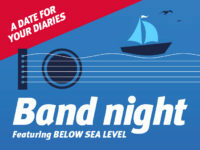 The band ‘Below Sea Level’ are a very popular band who appeal to all ages and music tastes. Doors will open at 7.30pm and the band starts at 8pm finishing at 11.30pm in the lower hall of the Leigh Community Centre, Elm Road. The bar will be open but feel free to BYO snacks, grab a table or dance the night away!